This release focuses on bug fixes and language translation updates that improve the usability of Manuskript for both fiction and non-fiction writers alike. This release was made possible by input and contributions from a growing community that includes users, reporters, developers, and translators. 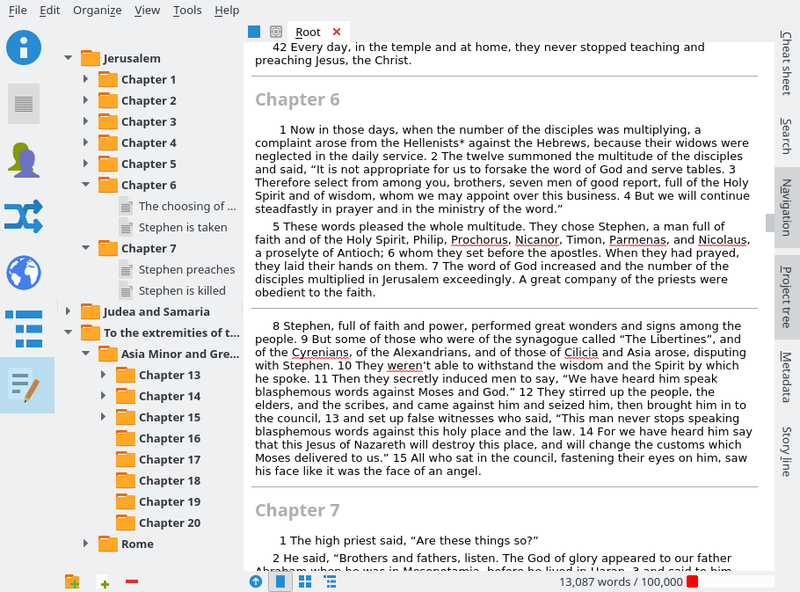 Thanks to you Manuskipt is becoming a more powerful writing tool. Your feedback and help is appreciated. Awesome, thanks for all the hard work! Thanks for this new version, is there a french manual somewhere? Wish you have some help to translate something? Documentation for Manuskript can be found on this web site and the Manuskript Wiki (editable by Manuskript users). I also wrote a tutorial entitled: Using Manuskript to Write a Fiction Novel. Currently there is no English or French manual so this is an available volunteer opportunity. Thanks for your hardwork 😉 ! Keep doing it! Really a wonderful tool! Especially that I can edit the markdown docs separately, making it cross-platform. Thank you! I started using Manuskript a couple of days ago and so far I love it. It has everything I was looking for in a novel writing programme – and some things I didn’t know I needed till I found them! I’ve got one wee wrinkle, though. I created my project on my desktop, and saved as multiple files so I can access them as plain text. I then synced this folder to google drive so I can access my project from anywhere. I then ran Manuskript from my laptop and clicked the ‘Open’ button on the startup screen, but when I navigated to the folder where I’d synced my project to it wouldn’t open the folder as it was looking for a file with a .msk extension. Is there a way to open a multi-ifle project in Manuskript, or do I have to save it as a .msk in order to open it? Thank you for everything you do with this software! ‘Glad you are enjoying the software. When the Manuskript setting Save to one single file is disabled, the project details are stored among the file “projectname.msk” and the folder “projectname” which contains multiple subfolders and files. If you wish to make a copy or synchronize the project, be sure to include both the project “.msk” file and the project folder and contents. Further be sure to only run Manuskript from one location at a time to avoid data loss due to one open editor clobbering the changes of another simultaneously open editor. Ahhh, I missed the .msk file when I synced. I’ve synced that file now too and it’s working. Thanks! and then the program is opened, but the blackbox remain in there. Because in other videos i ve seen of the program no one has this thing. I am worried this can affect in my project in the future. Yes, this is how the PyInstaller package for Manuskript is currently built. The console window makes it easier to report issues with Manuskript which is still in early development. See Issue #327 – Two Program Windows Pop Up. Package python3-pyqt5 is not installed. Package python3-pyqt5.qtwebkit is not installed. Package python3-enchant is not installed. Package python3-markdown is not installed. Package pandoc is not installed. Obviously, they are not installed. Is there an easy way to install them? The Manuskript Download page includes instructions and links to instructions on how to install Manuskript and all requirements. Be sure to follow all the steps for your respective operating system. For example if you are trying to install the .deb file then I suspect you skipped the second section of instructions which start with the sudo apt install -f command. First of all great programm, tested many, love its simplicity. It hangs on me a lot with longer text. Maybe because the spellchecker keeps turning itself back on when opening text in new tabs!? When I enter a search criteria e.g. ‘Lord’ all Chapters containing ‘Lord’ are listed below. Instead of highlighting the phrase ‘Lord’ the spellcheck is beeing activated and does its thing even though spellchecking was deactivated from the main menu. The search for ‘Lord’ is not visually reflected!! Also I would love to be able to only show icons in the navigationpane on the far left and controll their size too. I found the export window, is there an option to export text to single files per chapter / scene? The Dos/Terminal Box is anoying me but I understand its need from the developers POV. On the Mac I could not find a way to close open tabs but I did not look thoroughly. To view open and closed issues or report new issues, see Manuskript Issues. I use Arch Linux and launch Manuskript through Terminal. I also have a shortcut that allows me to launch it outside of a Terminal prompt. In both cases, I get a debug log. While this is okay in the former case, it’s a minor annoyance in the latter due to how my windows open maximized, resulting further in Manuskript being squished and needing to be resized. Is it possible on my end to install Manuskript without this log popping up every time I start? If it’s a matter of editing the source code before compiling it, I ought to be able to figure out what to do if you can point out what to do. Otherwise, it might be a good idea to include a debug log toggle in Manuskript’s settings in a future update. The log is extremely valuable for debugging issues. With manuskript in it’s early days of development we plan to keep this log at least until we leave pre-release status. That works for me! It’s a bit inconvenient, but I guess I didn’t realize how Manuskript is still in early development and a debug log is still necessary. My apologies.